It is always fun trying different wines and blends. 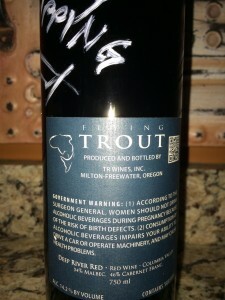 Last year during our Christmas break in Walla Walla, we met Winemaker Ashley Trout. Hearing her story was fun and you could see her passion making wine. Ashley has been making wine since 1999, when she was 18 years old. Originally from Washington, DC., Ashley moved to Walla Walla for college and started winemaking two weeks after arriving to town. Years later, a severe climbing accident caused her to be bed-ridden during a crush season, which in turn led her to realize just how much she loved her job. Not being able to wait another year, she decided to head to the southern hemisphere for their crush. Argentina’s Malbec and Torrontes were varieties that she fell in love with. Argentina’s lure was irresistible and so started her bi-annual, bi-hemispherical crushing and Flying Trout Wines. 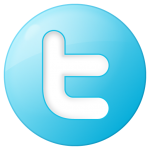 Medium color depth with a purple hue. Moderate young-fruity with aromas of spice, oak, cocoa, dark fruit, pepper and EtOH (alcohol). Dry, medium-bodied with slight tart acidity. Medium tannins and slightly astringent. Rich flavors with a long-lasting finish. Region/Appellation: Washington State, Columbia Valley. 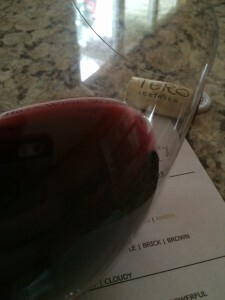 Blend: 54% Malbec 46% Cabernet Franc. 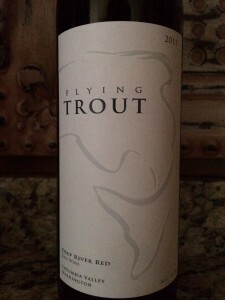 I rated the 2011 Flying Trout Deep River Red three glasses. The blend was interesting. Life is too short to drink crappy wine. Expand your palate and keep trying.